Schizostachyum glaucifolium (Poaceae), and other bamboos (*Kofe). 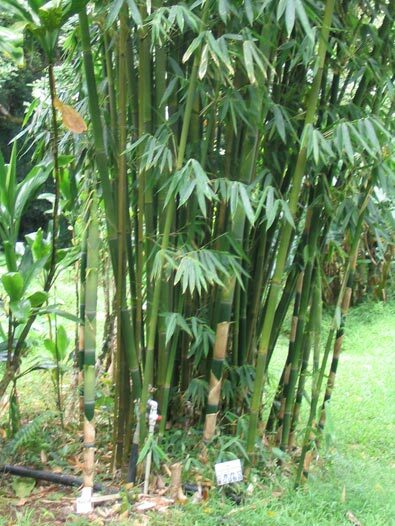 through PROTO POLYNESIAN *Kofe, S. glaucifolium and other bamboos, to: PROTO CENTRAL EASTERN POLYNESIAN *Kofekofe, plants having bamboo-like qualities. 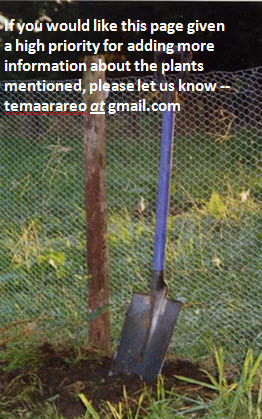 Fijian: Kovekove (a grass). A homonymous Fijian word refers to the "Sea daisy ", Melanthera biflora, Compositae - see notes below. Watch this space! 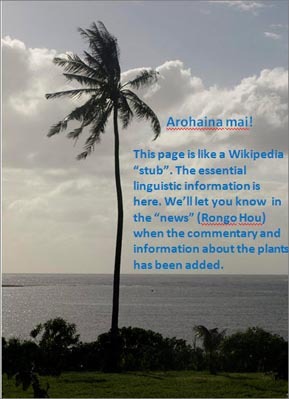 This is page is still under construction, but it contains the essential linguistic and botanical information, and some background information. More text and pictures will be added as soon as time permits. See the "News" for February 2016. In some Polynesian languages reflexes of *kohe have come also to mean "knife", originally a knife fashioned from bamboo (e.g. as still illustrated by Marquesan and Tuamotuan kohe, Tongan kofetafa), but in some languages now a term for knives in general (e.g. Tikopian kofe, Samoan 'ofe). There may well be a second *kofekofe, reflected in (or derived from the same source as) Fijian kovekove, Melanthera biflora, "Sea daisy ". Cognate with these would be Tikopian kohekohe, also denoting Melanthera biflora (Asteraceae) and Māori kohekohe, an alternative name for kōhia, Passiflora tetranda (Passifloraceae). 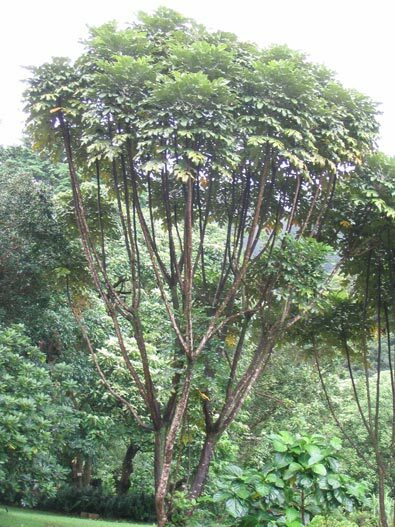 In addition to denoting certain bamboo species and bamboo-like grasses, the base and reduplicated forms of the reflex of this Proto Polynesian *kofe in Hawaiian refer to a group of trees of the genus Tetraplasandra which have long, slender trunks. This usuage is paralleled in Māori, where the primary referent of these words is also a tree, Disoxylum spectabile, which when a sapling is notable for its straight, slender, branchless trunk. Throughout tropical Polynesia bamboo was used traditionally for making musical instruments -- pan pipes in Tonga and Samoa, and nose flutes almost everywhere. In Plants in Samoan Culture Art Whistler notes that it is still used occasionally in Samoa for fishing poles, construction, pillows and water vessels, and a mixture of the ash from burned bamboo leaves with coconut oil is used to treat burns. Lengths were once used for storing the powdered material for traditional dies; bamboo was also used for knives and constructing a particular kind of fish trap. The traditional uses of bamboo in Hawaii were similar to those in Samoa: nose flutes, water containers, knives, fishing poles, and a component in medicine for burns; it was also used to make bamboo rattles for some more "secular" hula performances, and design-stamps for tapa cloth. In Hawaiian Heritage Plants Angela Kepler writes that "In ancient Hawaii bamboo was useful but not special. Apart from the belief that it was planted by gods and goddesses, there is no evidence that it was attributed any particular respect." ‘Ua tafea ‘o le tau‘ofe "the bamboo shoots have been swept away [as by a flood]"
seems absolutely secure, but if close to the river bank can be swept away unexpectedly by the floodwaters, as the most eminent people and families my be swept away by the vicissitudes of life. Apart from *kofe, the general word for bamboo itself in tropical Polynesia, at least four ancient bamboo-related words made it all the way to Aotearoa. A few others did not, among them Proto Austronesian *kawayan, reflected in several Formosan and many Philippine languages as the general word for all bamboo species. Another proto-Austronesian word, *betung "bamboo of very large diameter, probably Dendrocalamus spp." was also present in Proto-Oceanic, but, as far as we can tell, did not reach Polynesia. A few other words appeared at later stages of the development of Austronesian languages in "near Oceania", but do not seem to have reached Polynesia. Proto-Austronesian *tulani, "bamboo nose flute"
Proto-Malayo-Polynesian *tulali "bamboo nose flute"
Kavalan (Formosa): turani-an "nose flute"
Ilokano (Philippines): tulali "bamboo flute"
Fijian: dulali "Fijian nose flute"
This set of reflexes is especially important as it denotes "the only musical instrument which comparative linguistic evidence allows us to infer as part of Proto-Austronesian culture". Proto Malayo-Polynesian *bitung "species of bamboo"
Proto Oceanic *bitung "species of bamboo"
Malay: awi bitung "large bamboo - Dendrocalamus sp." Fijian: bitu "Bamboo species -- Bambusa sp., or Schizostachium glaucifolium"
Proto Oceanic *pupu "bamboo fish trap"
Kavalan (Taiwan): bubu "conical bamboo basket trap for fish"
Ilokano (Philippines): bobo "large bow-net made of fine heavy bamboo wicker work for catching shrimps"
Tagalog (Philippines): bubo "fish trap"
Fijian: pupu: "long narrow fish trap made of bamboo". The four that reached Aotearoa are Proto Malayo-Polynesian *kasaw "rafter", *pa(n)tar "shelf; bed frame of wooden or bamboo laths"; *teken "downward pressure; bamboo punting pole", and *bukbuk "weevil that infests wood, bamboo and rice; dust produced by the boring of this insect". These, with their Proto-Polynesian and earlier antecedents, and their forms and meanings in Māori and some other contemporary Austronesian languages, are featured on the page for the Māori reflex, kohe. Proto-Polynesian *fangufangu "bamboo nose flute"
Tongan: fangufangu "bamboo nose flute"
Samoan: fagufagu "bamboo nose flute"
Further information : See the Bibliography and linked pages. Acknowledgement: I am grateful to my friend and colleague Galumalemana A Hunkin for discussing the significance of the Samoan saying 'ua tafea 'o le tau'ofe with me.